As helpful as M is, her list is comprised of apples, cookies and cake. I needed another way to get the list made and get to the store in a hurry. I would like to introduce you to my new best friend, eMeals! I am in love with eMeals ! I was so excited to find out that eMeals offers a Gluten-Free meal planner- I just had to share it with you! The eMeals sign up process is simple and quick. It took me less than 10 minutes to complete the sign up, choose my meal plan option, get the week's menu planned and print my shopping list! It takes me longer than that to get my kids in the car to go to the grocery store. To sign up all you need to do is pick the gluten-free plan and number of people you are cooking for. The fun starts as soon as you get signed up. 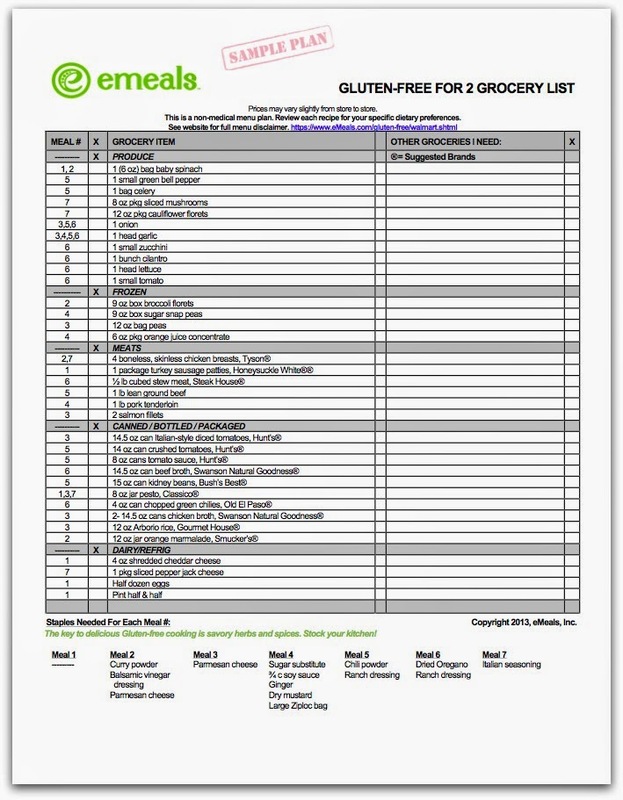 The eMeals team sends you weekly meal plans and a grocery list that is already categorized by department! What is better than having the recipe right on the meal plan? 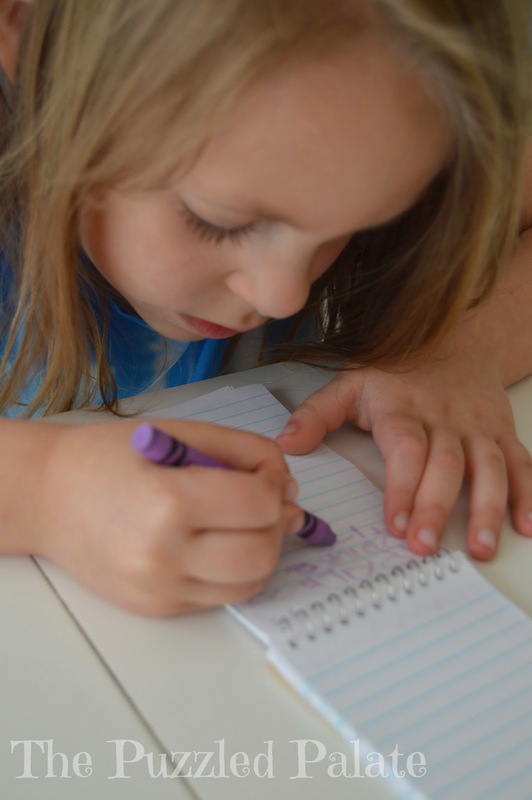 Gluten-free grocery list ready to go. All you have to do is click & print! Not to worry! 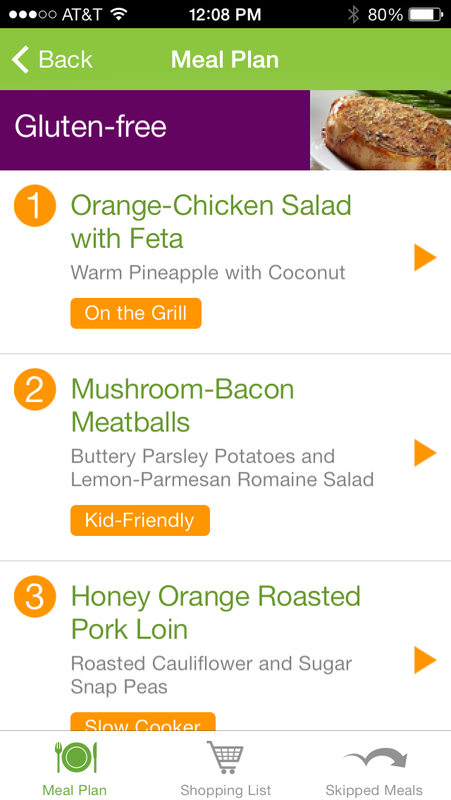 If you don't have a printer, ink or time to print out the list- just download the eMeals app on your smartphone! The FREE eMeals app is meal Planning at your fingertips , providing you with a personal menu planning assistant in your pocket. Just grab your phone and head to the store. My favorite feature is the easy check-off list on the smartphone app! I know you are chomping at the bit to go check it out for yourself. Before you do, I wanted to add one more cherry on the top of this sanity saving service. The eMeals team wants to give you a free 2 week trial- no strings attached . An entire year's worth of meal planning is less than $50 when you use the code. I did the math for you...that is less than $1 a week! I could find that under the couch cushions, so why not spend your pocket change on something that will save you time, money and frustration? If you come up with an excuse- let me know because I can't think of one! Check out their Easy & Delicious Dinner Ideas For Busy Families on a Budget to get started and enjoy your new found free time! How do you plan healthy meals for your family? Do you have family favorites or do you like trying new recipes? 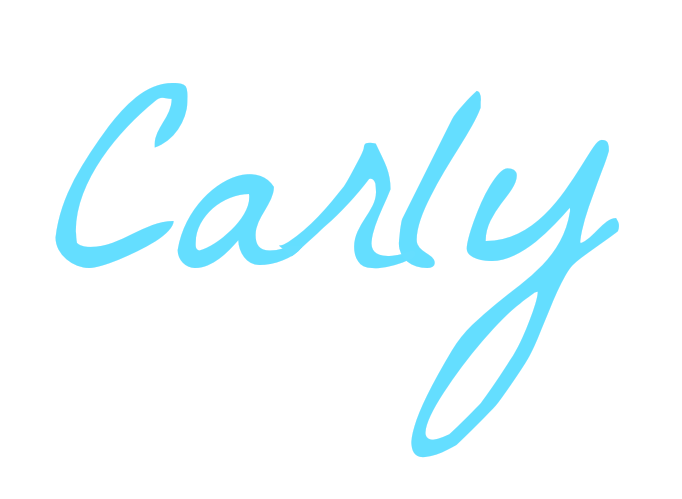 Disclosure: I am a member of the eMeals Blogger Network which includes a one year subscription to eMeals. This post also includes affiliate links. All opinions are my own. That sounds like such a great tool. I am SOOOO bad about meal planning and I really need to get better. I have heard of emeals and I really need to check it out! This sounds awesome!! Planning gluten free meals can be tough. I don't really plan meals anymore. My children aren't little...22, 16, 14. But if I know it's gonna be a long day at the office or with their activities, I'll through something in the crock pot the night before. Otherwise, we're just winging it! Thanks for sharing! I like that you can pick and choose. I also like that you can change menu plans at any time. We totally love the gluten free emeals. I just have to modify them when they call for dairy, but so far, we've been pretty lucky! I LOOOOOOOOVE emeals. Clean eating is the bomb dot com. Emeals is my favorite! I've been on the paleo one for over a year! I so love eMeals as well! We did the Classic Plan this year and have loved many, many of the recipes. Next year, I think I want to try a different plan just for some variety. I have a list of recipes that I pick from. I also make a 2 week meal plan to try to stay out of the stores so much. This sounds like a great app! 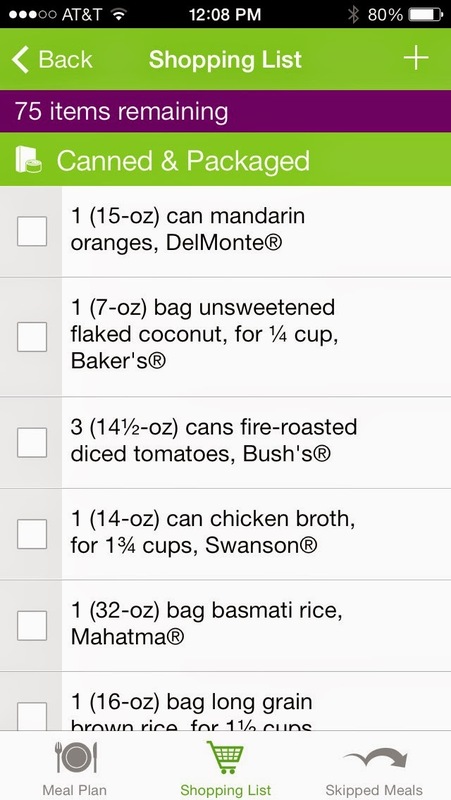 Meal planning would definitely be much simpler when you have a handy app like this. While I am not gluten free, I do like that there is an option like this for those who are! I need to be better at planning healthy meals. We just got our kitchen back this week after a 3 month remodel and that is something I look forward to doing. 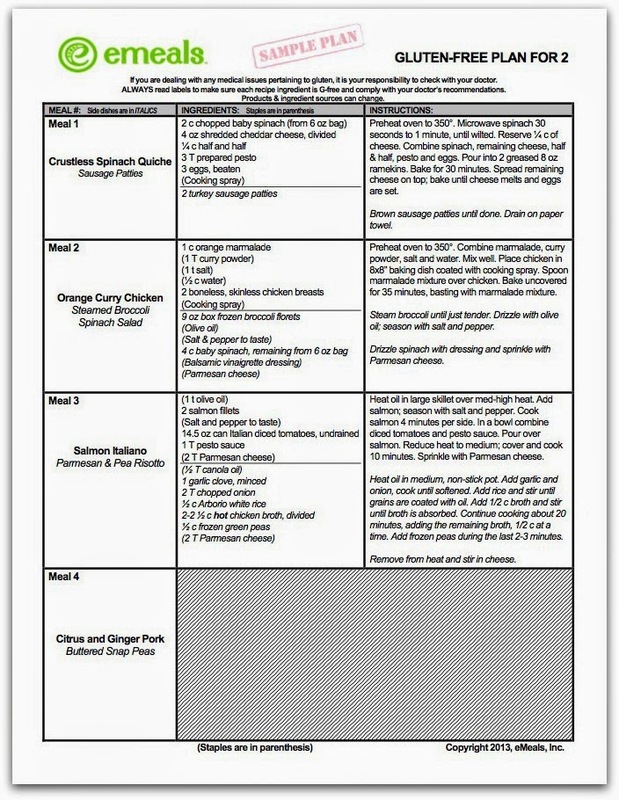 This eMeal plan seem like it would be very helpful too. I love emeals! We used to use this all the time, I need to get back into it. So wonderful.... and easy to use! Meal planning is my favorite, Every Sunday I sit and write down what I plan for the week! I usually get the recipes off pinterest for the week! I really like the meal planner with eMeals. We are trying to eat a healthier diet, and some of their recipes are phenomenal! This is nice to know about, and 15 % off is a nice discount. Thank you for sharing the offer. I am in LOVE with eMeals. I've used their meal planning service for quite some time now. Their shopping list feature is such a time saver AND a money saver. I had NO idea that they offered a gluten free menu now though. That's awesome. Seems like they're always adding new menus! I'm a combination of both. I love some family favorites (both eating and making) and I love trying to come up with new recipes. This is a great service, saves so much time and energy. I didn't know they had an app. That is a neat service. Meal planning can be hard enough without having to deal with allergies and dietary restrictions. To answer your question, I don't plan meals, I'm TERRIBLE at it. I'm going to have to check out that app! I love that emeals has gf options. The world is opening up for people with sensitivities. I love emeals! We haven't tried this option yet, but love their others. I love meal planning- it really has made life so much easier. Pretty awesome they have GF options! I've heard great things about emeals! Honestly, I plan everything BUT our meals. (I'm not much of a cook). Somehow we manage to eat mostly healthy, but I'd love to find a way to be even more conscious. Maybe emeals is it? Very cool! I've heard such good things about emeals. I am considering trying them out. wow! This is great! I'm glad Emeals has so many options. I'm going to have to sign up for emeals.